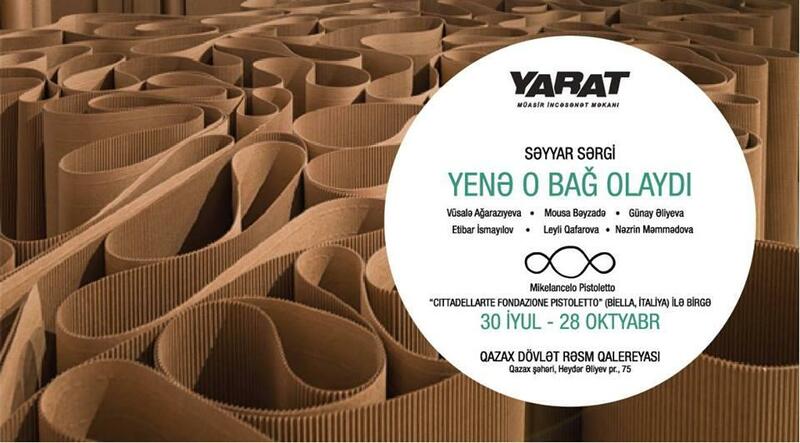 YARAT Contemporary Art Centre will host "YENƏ O BAĞ OLAYDI" (ONCE AGAIN THAT GARDEN BE) traveling exhibition in Gazakh region. The exhibition will be held on July 30-October 28. The opening is scheduled for July 30 at 3.00 p.m.
YARAT Contemporary Art Centre presents a travelling exhibition with works by renowned Italian artist Michelangelo Pistoletto and emerging local artists. The exhibition is the result of a workshop given by CITTADELLARTE Fondazione Pistoletto (Biella Italy) director Paolo Naldini discussing the theory of the “Third Paradise” developed by Michelangelo Pistoletto. The theory wants to overcome the current worldwide existing conflict between the two polarities of nature and artifice, it aims to create a new humanity with a responsibility for the own environment in harmony between technology and nature.